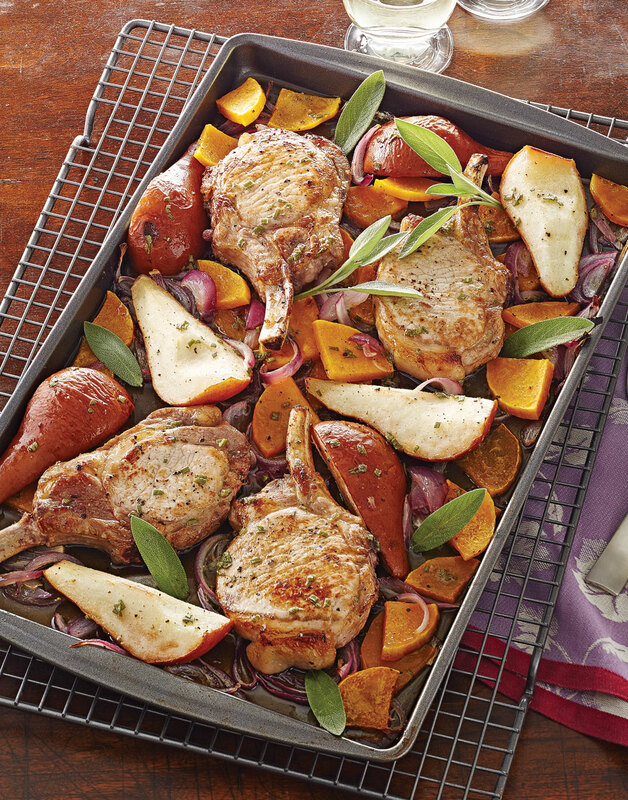 Autumnal flavors shine in this full-meal roasted dinner of sweet pears and butternut squash, along with savory red onion and meaty pork chops. Toss pears, squash, and onion with 2 Tbsp. oil; season with salt and pepper. Transfer pear mixture to an 18×13-inch baking sheet; roast until pears and squash are crisp-tender, 15 minutes. Whisk together honey, butter, sage, and vanilla; season with salt and pepper. Heat 2 Tbsp. oil in a sauté pan over medium-high until shimmering. Add pork chops; cook until brown, 2–3 minutes per side. Arrange chops on top of pear mixture. Drizzle honey sauce over chops and pear mixture. Roast chops until a thermometer inserted near but not touching the bones registers 145–150°, 10 minutes. Serve pork chops with pear mixture and sauce; top with cheese and sage sprigs. To ensure the butternut squash cooks in the same amount of time as the other ingredients, slice it thin. So the chops have color, sear them in a pan first, then add them to the baking sheet to finish cooking.